What Section is behind the Lakers Bench at Staples Center? Looking to sit behind the Lakers bench at Staples Center? Sections 119, Premiere 4 as well as Section 334 are directly behind the Lakers bench at Staples Center. Section 119 is directly behind Lakers team bench and will be your best and closest option for sitting behind the Los Angeles players, but also the most expensive. 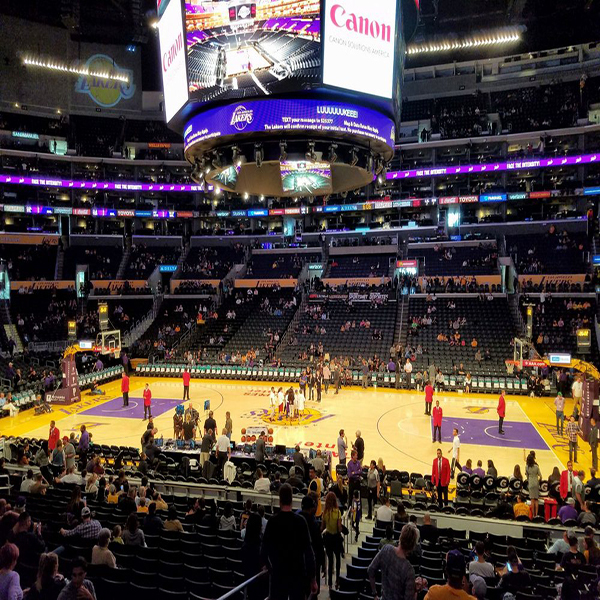 Staples Center section 119 offers a subsection of two rows that are designated as Courtside seats (Section 119CT), these are the closest seats you can get to the Lakers team bench. Sitting in lower rows in Section 119 may have obstructed views during the game. – Laurent C, Los Angeles. Sitting in rows 10-20 in Section 119 is a bit less expensive then Courtside or the first couple of rows and offer better sightlines of the entire court. View of the Lakers game from Section 119. An alternative seating option is section 118. The Los Angeles Lakers enter the arena floor, between section 118 and section 117. Section 118 Row 1, as well as Section 117 Rows B-H will be your best opportunity for viewing the team as they walk on and off the court and maybe get a high-five. 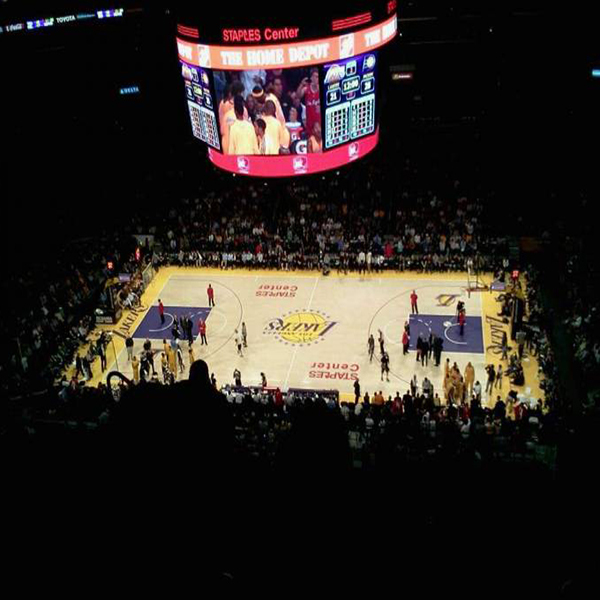 View of the court from Staples Center Section 118. The higher row seat numbers in Section 118 are on your left if facing the court and also just behind the Lakers team bench. Premiere Level Section 4 is the second level up from the court and directly behind the Lakers team bench. Rows in Premier 4 are labeled 1-10, with row 1 being the lowest in the section. An entrance to the Staples Center Premiere 4 section is at Row 10. In the Premiere level, you are elevated and have excellent unobstructed sightlines of the basketball court. Sitting in Premiere 4 for a Lakers game places you not only behind the team bench but close to center court. The Premiere offers some great amenities including, more full seats, Access to San Manuel Club ( full bar buffet table), waitress service at your chairs and a Private Entrance into the Staples Center. The upper-level Section 334 is directly behind the Lakers bench and your least expensive option out of all three sections behind the Los Angeles bench. An entrance to section 334 is in row 2. If possible stick to rows 6 in and lower in section 334 for the best views of the game. View of Lakers game from Section 334 Row 8 Staples Center. Staples Center Section 334 is not only behind the Lakers team bench, but it is also just to the right of center court section 301. The upper-level concessions next to section 334 are the Coca-Cola Area. The Ice Cream Sandwiches, Cotton Candy, are kids favorites in the Coca-Cola Area. Need help finding the perfect Lakers Tickets? 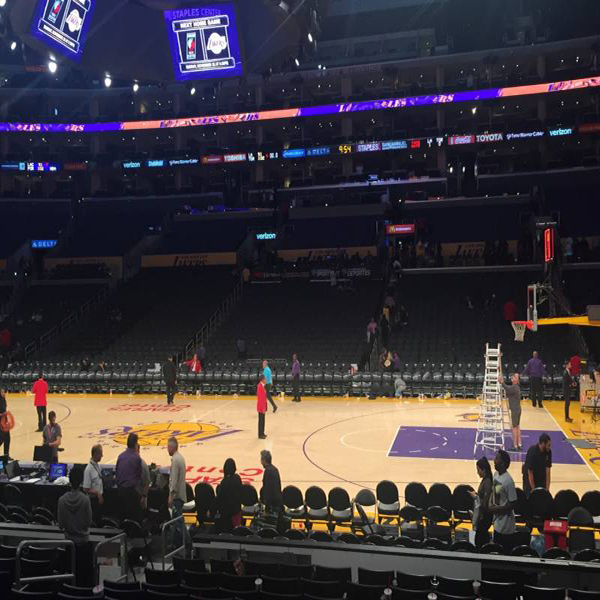 Pingback: How Much Are Lakers Tickets at the Staples Center?